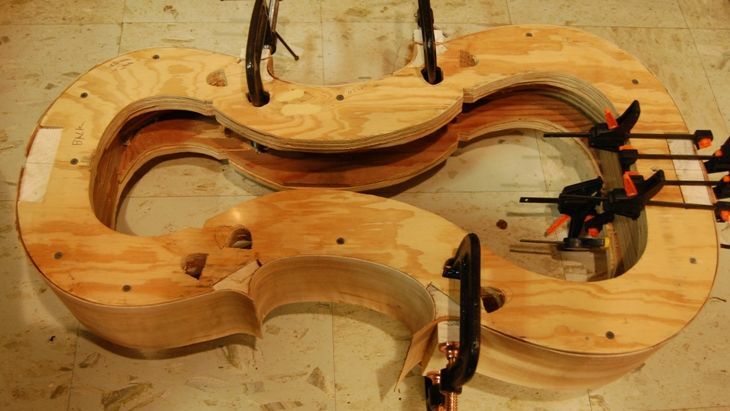 Cello ribs installed in the mold, glued and clamped to the blocks. Yes, you have to keep the wood warm! The weather outside persisted in temperatures hovering just above freezing, so I brought the project indoors, heated the joints with a heat-gun, brushed hot water, slathered hot glue and clamped ’em home. Good glue squeeze-out all around; should be very good joints. All ribs installed–glued to the blocks in the mold. Next step is linings.